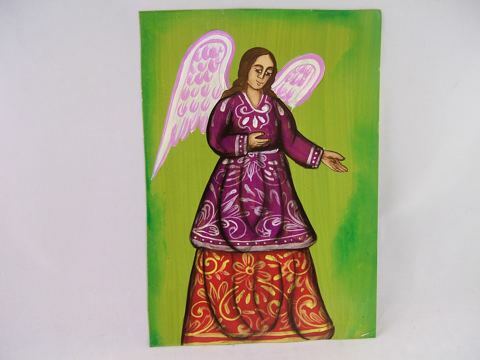 Our gorgeous Angel Retablo was painted by traditional artisans in Mexico - on recycled, rusted tin sheet. She is almost 9 inches by 12-1/4 inches. Each retablo is hand-painted, so each will differ slightly. Expect the metal to age gracefully over time. This particular retablo features an angel with hand outstretched as if to offer assistance and love. She is dressed demurely in an elegant robe of purple and rust. Traditionally retablos are created to thank, entreat or venerate saints, angels, Jesus or Mary. Many are hung in the backs of churches (sometimes with milagros added). Once the supplicant felt that prayers had been answered, the retablo was then removed to the home. Retablos are often painted by artists as not all the faithful have talent enough to render their prayers visually. Most retablo art is somewhat primitive and was once considered outsider art. With help from Frida Kahlo, Diego Rivera and their contemporaries, retablo art has become quite collectible in its own right. Seeking to preserve Mexican and other Latin American traditions, Kahlo and Rivera began collecting these wonderful spiritual treasures in the last century. You might consider framing your retablo in a simple wooden frame (without glass is best!) 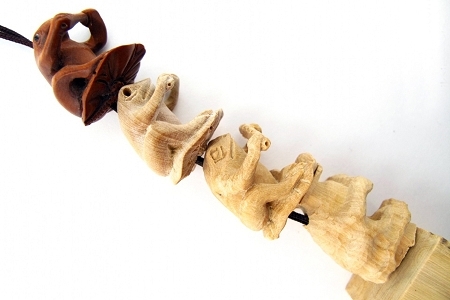 or shadowbox wooden nichos. We like to hang them in the traditional manner with a single simple nail hammered through the top of the tin right into the wall. Because it is made of tin rather than paper, your nicho will easily stand on an easel as well.